Andrew Lohse should be ashamed of himself. There’s a post on “The Choice” blog of “The New York Times” by Lily Altavena that asks if allegations of hazing at Dartmouth College will affect prospective students. Ms. Altavena is referring to the article in “Rolling Stone” in which an angry, crusading former Dartmouth student goes off on a vitriolic tirade against the College on the Hill. 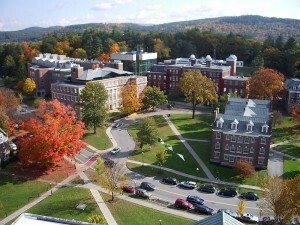 If you don’t know about the article, read our post on Dartmouth College Fraternities. Our answer is no. Allegations of hazing at Dartmouth will not impact Dartmouth’s bottom line in next year’s admissions cycle (or in this year’s yield). Students and their parents are savvy enough to know that where there are fraternities, there is drinking. And there are fraternities at many colleges. Not just Dartmouth. If they actually read the “Rolling Stone” piece, they’d also probably realize that the former student had serious issues with the school. People aren’t naive. They don’t think that students just read books and discuss Greek myths in fraternity basements. And if that were the case, they probably wouldn’t think fraternities were cool. Who wants to discuss Greek myths on Saturday night in your prime? So, no, this article — as controversial as it might be — will not impact the Dartmouth admission stats. Will it help to further the College on the Hill away from its old reputation as Animal House? No. But it’s not going to have the impact the angry student wanted it to have. I respect your savvy very much and often read your web site to hear the latest (and often best) information on admissions trends and events at the most prestigious schools in the country. By doing so, I know you have a special place in your heart for Dartmouth. Nevertheless, I disagree with your assessment of the “hazing” there. The events chronicled in the Rolling Stone article come from students other than just Lohse, and border on criminal battery. This is not the “hazing” typical of other schools (except perhaps at the Citadel, see the Lords of Discipline) and should not be dismissed as simply a drinking problem. The sororities seem to recognize the problem and warn their members about which frat’s to avoid, further underscoring the seriousness of the situation. Whether or not the article has any significant impact on Dartmouth admissions is really beside the point. (I know that my son, who is looking at small LACs and liked Dartmouth will not be applying there and will instead use his ED on Brown). I hope that it serves as a wake up call to the administration to rein in some of the more outlandish practices at the fraternities there.